Home > Free > Capital One 360: Earn up to $225 in Cash! Capital One 360: Earn up to $225 in Cash! 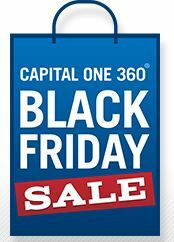 Capital One 360 is offering all kinds of Black Friday Bonuses! This is my favorite sale of the year. We’ve had accounts with this company from back in the day when they were known as ING. It’s super easy to transfer money and for most accounts the interest rates are much higher than you can get at a local bank (currently .75%). You can earn bonuses by opening each account type. Open a checking account and use your Debit Card to make (5) purchases or make (5) remote check deposits (or a combo of both) within (45) days of opening your account. Open a FREE 360 Savings account with an initial deposit of $500 or more. Bonus is deposited immediately. Open a Kids Savings account (no minimum deposit). Bonus is deposited immediately. After you open your account, refer friends and family and earn a $100 bonus for the first (2) people who open accounts before 12/15 (they will earn new account bonuses, too).